By the 1840’s the term Oregon Country referred to all land from the border with Spanish Mexico (the northern border of California) to the border with the Russian territory in Alaska, from the pacific Ocean to the Rocky Mountains and by 1843, the most important move towards an independent Pacific Northwest was established with the Republic of Oregon, encompassing almost all of this territory. This land was jointly claimed by the U.S. and Britain, and it was not until 1846 that the dispute was settled with the extension of the 49th parallel across the continent, with the exception of Vancouver Island. Euroamerican settlement was sparse but growing, as fur trappers operating in the area in the 1830’s began to settle down, often intermarrying with the native population. Hudson’s Bay Company and various stripes of Catholic and Christian missionaries had outposts in the country, and were the de facto government for Euroamericans. The Hudon’s Bay Company held judgment over British Columbia, while the missionaries had outposts in the country, and were the de facto government for many of the American settlers. In 1841 near Newberg, Oregon, members of the Methodist missionary community met together on February 18th and drafted an initial plan for a provisional government, though when put forward at a public council meeting, this first effort was struck down by Catholics under the guidance of Father Blanchet. These sentiments began to change by 1843, as more settlers continued to arrive in the Willamette Valley, not just drawn by the allure of the fur trade (which was beginning a precipitous decline due to over hunting), or the need to ‘save the souls’ of the native population, but also to begin a new life in the fabled Oregon Country. A series of ‘Wolf-Meetings’ had been held that winter to organize armed patrols throughout the region to help control predation of livestock. With these meetings, the sentiment that Oregon needed a government continued to grow. At the start of May, settlers, Hudson’s Bay men, and missionaries gathered at Champoeg, on the bank of the Willamette River near Newberg and on May 2nd the most prolific ‘Champoeg Wolf Meeting’ was held, in which organizing a government was heavily debated. It was decided that the proposed government was to be an independent republic. Some opposed it both as either loyal subjects of the British Crown, or as American citizens (the Methodist missionaries had already sent petitions to the U.S. Congress, asking that body to extend protection to its settlements, but with no response). Mountain man Joe Meek famously drew a line in the sand and demanded those in favor of the government to one side, those against to the other. By the end of the day, the vote for an independent provisional government was passed by a vote of 55 to 50, and the Republic of Oregon was born. A committee was immediately appointed to begin drafting a constitution, and assembled July 6th to pick a legislative and executive committee. In May of 1843 the European settlers in the Oregon Territory established their first “western style” Provisional Government. Several months later the Organic Act (5th of July 1843) was drawn up to create a legislature, an executive committee, a judicial system and a system of subscriptions to defray expenses. Members of an ultra-American party insisted that the final lines of the Organic Act would be “until such time as the USA extend their jurisdiction over us” to try to end the Oregon Territorial independence movement. George Abernethy was elected its first and only Provisional Governor, but the opposing faction led by Osborne Russell favored Independence. Russell proposed that the Oregon Territory not join the United States, but instead become a Pacific Republic that stretched from the Pacific Ocean to the Continental Divide. The government of the Republic of Oregon was based on the model of governance, that is to say a republic, and it’s boundaries reached to Russian America (Alaska) in the North, south to Mexico (present day California) and east to the Rocky Mountains. Legislators set about writing the ‘Organic Laws of Oregon’ and in her 1870 biography of Joe Meek, River of the West, Frances Fuller Victor writes “there were those in the legislative committee for 1844, and in the executive committee also, who were revolving in their minds the question of an independent government; that is a government owning no allegiance either to the US or Great Britain, but which should lay the foundations of an empire on the Pacific Coast”. In 1844 the Republic of Oregon executive committee published the following statement: “And we sincerely hope that Oregon, by special aid of Divine Providence, may set an unprecedented example to the world, of industry, morality, and virtue. And, although we may now be unknown as state or power, yet we have the advantages by united efforts of our increasing population, in a diligent attention to agriculture, arts, and literature, of attaining, at no distant day, to as conspicuous an elevation as any state or power on the continent in America”. This is summed up well in by an article in 1855 from a periodical the Standard (run by the Democratic Party) entitled “Our Future”, published in Portland: “In a new country there are no old associations, no stereo typed habits which filter in an accustomed routine our actions and our thoughts. Yes, it is indeed too true that we must look for new and energetic governments in recently settled countries. . . . Can- it be possible that within a few years the Pacific coast will ask, and can secure, an independent government? If Nature ever marked out the division of countries, it has done so in North America. The vast chain of the Rocky Mountains present an unmistakable boundary, and we have reason to believe that these boundaries, laid down by an over ruling providence, ought to be more strictly regarded…. Should we secure anything to our advantage by coming into the Union which we could, not have by ourselves? Let us think before we act. The growing disparity of habits between us and the Atlantic states, and the pecuniary advantages or disadvantages of a separation from the states, are not the only questions which ought to be considered. Is it policy for us to join a government, the different sections of which are even now antipodal on a most exciting question, and which are cultivating a spirit of disunion by their altercations? These sentiments continued to grow, spawning into the Klamath, Trinity and Jackson movements, largely dying with the beginning of the US civil war in 1861. With the outbreak of the civil war, while the Southern states broke away to form the Confederacy, many supporters of a sovereign Oregon territory saw it as a perfect opportunity to give new life to Jefferson’s original idea, especially because the Oregon territory had not yet been broken up into states. The most famous movement attempted to establish a country under Thomas Jefferson’s original vision: the “Republic of the Pacific”. The American government however launched a successful propaganda attack to destroy the Pacific movement by associating it with a group called the Knights of the Golden Circle, which was a pro-Confederate, pro-slavery organization. At the same time, other movements inside of Cascadia, such as the Klamath movement, Trinity and Jackson movements all sought to wrench certain areas of Cascadia free from U.S. control. These too failed, largely by being put down through various uses of force. As these events were occurring to the south, British Columbia also actively threatened to secede, almost immediately after leaving the Oregon Territory. This largely had to do with the initial failure of the transcontinental railway promises that were one of its conditions for joining with Canada. Later, these disputes would lead to the Columbia River Treaty, where then premier WAC Bennett would threaten to “take BC out of Canada” – and the Yukon as well – if Ottawa and Washington would not accede to his demands. This was the first of several conflicts to arise; as this part of the West was still relatively independent, culturally distinct, and as increasing Anglophonic colonization from the east disrupted this balance, setting the stage for the Red River Rebellion in Manitoba against Canada in 1870 by the Metis and the Northwest rebellion in Saskatchewan in 1885. 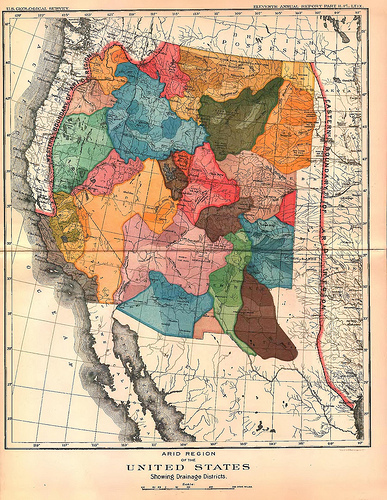 An proposed vision for the western United States, along bioregional and watershed boundaries. “That the West should un-falteringly follow the East in fashions and ideals would be as false and fatal as that America should obey the standards of Europe. Let the West, daring and unprejudiced, discover its own ideals and follow them. The American standard in literature and philosophy has long been fixed by the remote East. Something wild and free, something robust and full will come out of the West and be recognized in the final American type. Under the shadow of those great mountains a distinct personality shall arise, it shall adopt other fashions, create new ideals, and generations shall justify them” (“With Due Formality” 1894). This mindset continued to play an important part in sparking a fierce internal debate over the place and identity of the Pacific Northwest in a broader context and was embraced by a number of different groups with generally similar aims. Some groups have sought to extend the interpretation of “Cascadia” to embrace parts of Northern California and Alaska, while others are more closely aligned with such related concepts as the State of Jefferson, the New California Republic, the State of Trinity, State of Jackson, State of Klamath, State of Shasta and Pacifica. Political motivations for the secession and autonomy movements deal mostly with perceived shared Cascadian political culture, values, language dialect, history and interests, which the eastern federal governments are accused of ignoring and being out of touch with. I am proud to be a Cascadian. I think we can set a better influence on the World than America can in our independence.